Non-Citizen Struggles producing a new Radical Europe. Refugee Protest Camp Vienna (A), MigSzol (HU), The Voice (D), Refugee Strike Berlin (D), Refugee Protests in Poland. Tbc: Refugee Tent Action (D), San Papiers Collective Paris (FR), Asante (GR), Refugee Protests in Bulgaria. Forms of Refugee and Migrant Resistance. Presentations and discussions on transnational organization, publicity and demands, followed by workshops. The Worldhouse, a center for undocumented migrants in Amsterdam develops forms of activism which combine support and visibility. The passport of Amsterdam, a booklet including the rights and services concerning undocumented inhabitants of Amsterdam is one example of this approach. Another approach is given by the Dutch Labour Union who accepts undocumented cleaners as members and activists for their campaign “Schoon Genoeg”, too. Presentation by Evelyn Schwarz, Worldhouse, Amsterdam. Which strategies have been used to reach visibility? Which media have been used or newly created by different movements? Has visibility in mainstream media and in society in general been a goal, and, if yes, how has it been reached? Which forms of action have we used to show our resistance in the streets? Presentation by activists from Copenhagen (DK) from the Kirkeasyl protests (2009) and the current campaign “Her Er Plads”. In June 2014, elections to the EU Parliament will take place. Many of the demands of refugee movements address the EU level, e.g. with regard to Dublin II/III regulations. The refugee movement in Berlin has started to collect these demands as a preparation for a campaign within the framework of the European Parliament elections. Presentation and discussion. We are surrounded by structural violence that attacks human dignity each day, the new Goliath. But our strength is our weakness. We will collectively use our bodies through simple theatrical techniques of human statues and comics, preparing to defeat Goliath. Against Goliath is a technique of the Theater of Hearing (Teatro de la Escucha). Born 20 years ago in Spain, its roots are in the Pedagogy and the Theater of the Oppresssed, non-violence struggles and many different social and political theaters from all over the world. On the base of hitherto work by the refugee movement in Berlin we shall collect transnational demands to be addressed to the European Parliament and search for adequate forms for a campaign in the run-up to the European elections 2014. 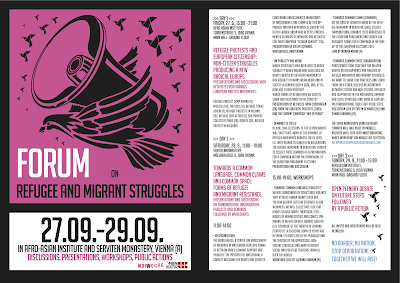 Participants come together for an open debate on achievements and failures of refugee movements and migrant struggles. We want to share our practices and learn from each other; discuss relationships between Citizens and Non-Citizens, refugees and supporters in the movements; improve our local strategies and think of developing transnational tools for future steps. Lead by Evelyn Schwarz (NL) and Somah Ibrahimi (AF). The three workshops will take place in parallel. will be held in English.